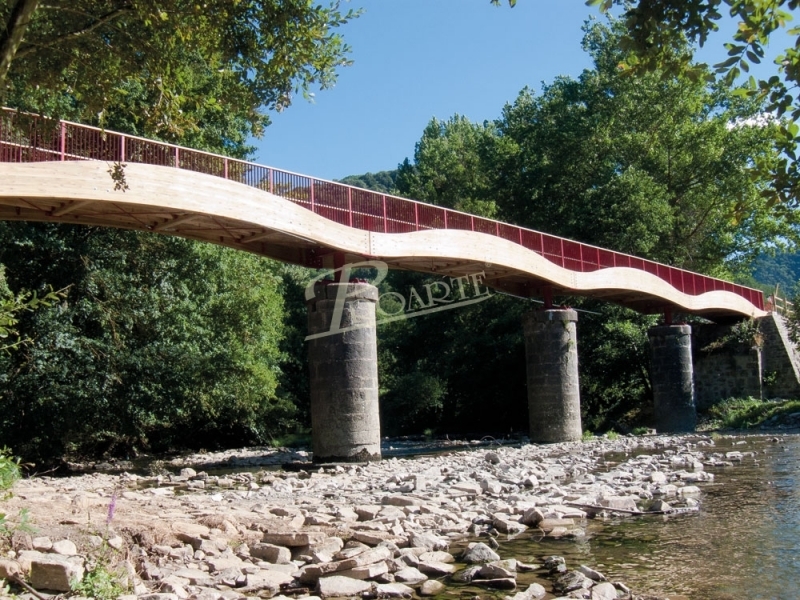 Manufacture and installation of a mixed metal-wood pedestrian bridge with a span of 45 metres. 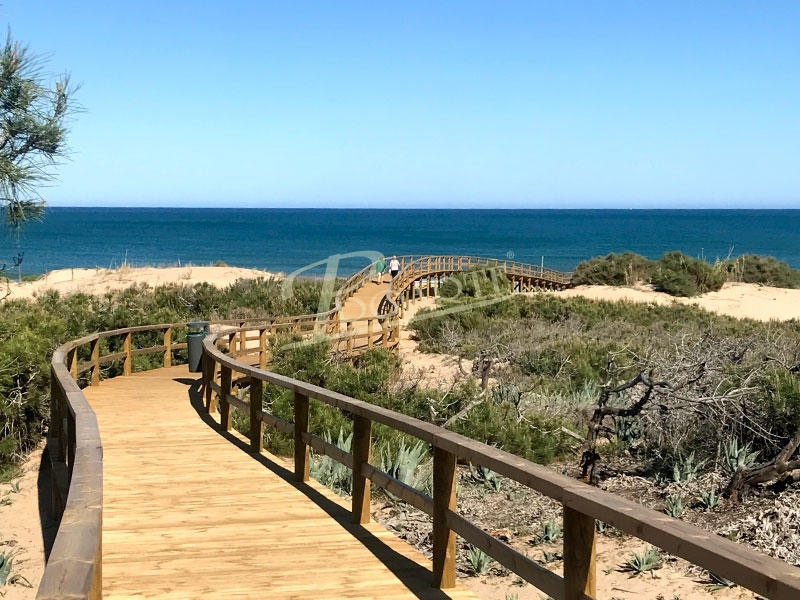 (Le informamos que nuestra empresa permanecerá cerrada por vacaciones del día 18 al 22 de abril, ambos inclusive. PROARTE is the most complete solution for your need to prepare any rural or urban setting with a well-cared for aesthetic, impeccable design and a quality that has made the company the benchmark in its sector. Specialists in providing solutions, defining spaces and personalizing environments, this company is capable of optimizing its products at all times to make your investment profitable. The work PROARTE carries out is structured in two main lines of business. 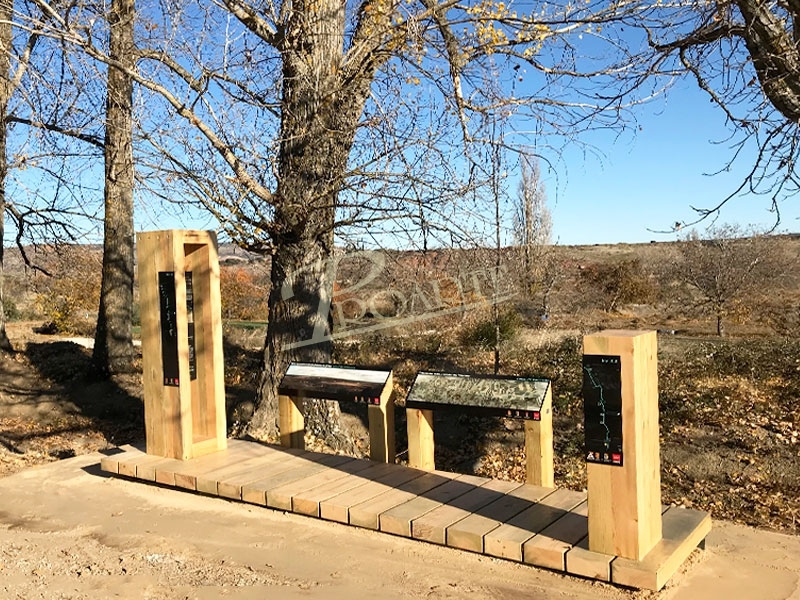 On the one hand, signage for paths, hiking routes, ski resorts or golf courses and, on the other, equipment and furniture for natural and urban settings in which the highlight is its creation of tailor-made infrastructures. As a supplement to these activities, the company has developed another portfolio of businesses that are quite distinct from its main one, namely printing, forestry work or consultancy services. Discover what the PROARTE brand can do for you: an inhabitable setting that is both welcoming and pleasant, a scenario inviting you to relax and enjoy life in direct contact with nature. PROARTE’s technical team and the members of the R&D+I department are constantly evolving. We are currently developing and manufacturing new products for the signage, furniture and equipment range that will be accessible for all by successfully exceeding the requirements for accessibility and quality. Above all, PROARTE imposes the maximum quality in all its work by applying exhaustive monitoring to everything from the initial phase (scoping of the project) down to the final stage (the finished product after installation). All PROARTE products are subjected to the most rigorous and comprehensive quality assurance checks to guarantee their durability over time. Our R&D+I department works constantly to improve the quality of processes, products and services. In order to ensure this commitment is fulfilled, PROARTE put in place quality assurance systems certified to the ISO 9001 international standard and also ISO 14001 for environmental management.